As trained and certified with the stakeholder centered coaching methodology developed by Dr. Marshall Goldsmith we are able to deliver high quality and consistent stakeholder centered coaching services for leadership development projects for C-level and middle level managers in Bulgaria. Phase 1. Introduction to Stakeholder Centered Coaching including coachability review and commitment to leadership growth of the leader being coached. Phase 2-4. Selecting leadership growth areas. The leader selects a handful of stakeholders who take part in the 360 degree structural leadership assessment and behavioral interviews. These stakeholders will support and assess the leader’s leadership growth progress throughout the yearlong (or shorter) program. Based on the assessments the leader chooses 1-2 key leadership behaviors to enhance his/her leadership effectiveness. Phase 5. Leading Change Involving Stakeholders – 6-18 monthly coaching and action planning sessions. Mastering the Stakeholder Centered Coaching process creates an on the job coaching process. Through monthly coaching sessions and interaction with stakeholders the leader creates a real time on the job leadership change process for himself and his/her subordinates at the same time. Phase 6. Leadership Growth Progress Reviews. On a quarterly / annual basis the stakeholders assess the leadership effectiveness growth progress (in qualitative and quantitative terms). Phase 7. Leader as Coach. Equipping the leaders to continue the process on their own and coach their teams (and themselves) to grow their leadership effectiveness going forward. In the end coaching should not be viewed as a ‘one time intervention’ but as a ‘must have leadership skill’ same as e.g. empowerment, communication, decision making and execution. 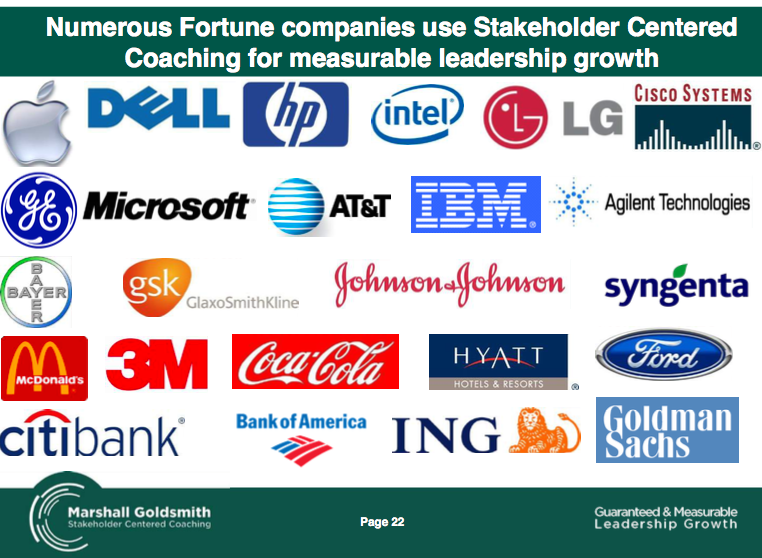 ​Marshall Goldsmith Stakeholder Centered Coaching makes leadership growth a real time on the job process that drives lasting value for the leader and the organization.